We’re going to let you in on a little secret: If you ever want us to attend an event, just mention mac and cheese and we’ll be there in a flash. It’s the one meal we will always drop everything for. Whether it’s because it’s the simplest (and most delicious) recipe we can pull together in less than 20 minutes, or because it reminds us of being a kid (food nostalgia is a thing, right? ), we are crazy for this comforting dish. But in order to live our healthiest life, some of our go-to dishes require a bit of a shake-up to satisfy our nutrition goals, which is exactly what dietitian, nutritionist and plant-based eating advocate Ellie Bullen has done. 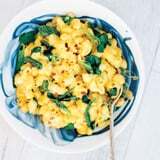 For her cookbook, Elsa’s Wholesome Life ($34.99), Ellie has perfected a vegan and gluten-free version of our favourite meal, which everyone can enjoy. There are just so many things to love about this pasta dish. It’s not only incredibly easy to make, but also really healthy (the nutritional yeast gives it that cheesy flavour). Plus, the pumpkin and cashews are so creamy and sweet. Cashews are a staple in my pantry – they are high in vitamin E (an antioxidant), magnesium (important for blood pressure regulation) and zinc (which aids in immune function and healing), and they don’t need as much soaking as other nuts. Bring water to the boil in a saucepan over a high heat. Add pumpkin, cover and boil for 8 minutes, or until pumpkin falls apart when pierced with a fork. Drain, reserving the cooking liquid. Place pumpkin, cashews, yeast, garlic and salt in a blender and blend until smooth. Add three-quarters of the reserved cooking liquid and pulse to combine. Set aside. Cook macaroni according to the packet instructions. When al dente, turn off the heat and add spinach leaves. Drain immediately. Add pumpkin sauce and stir until the pasta is well-coated. Season to taste with pepper and chili flakes. Serve immediately.